Below is our review of the Samsung 300E5A, a 15.6" laptop, featuring 6GB RAM, 750GB hard drive and Windows 7 Professional 64-bit. So you're looking to buy a new laptop, and have around £400 to spend? We look at the Samsung Series 3 300E5A, and see if it should be considered for purchase against it's numerous rivals. The exterior of this notebook, similar to the interior, has a two tone design finished in silver and black - it looks smart, and all of our testers liked the general design. Upon opening you are faced with a low profile full width keyboard, spanning the laptop. The letter keys are situated to the left, in order to also squeeze in a full number pad to the right hand side. The keys are evenly spaced, and despite being quite low in terms of profile, are easy to type on - it felt comfortable sitting in front of this laptop during our brief typing test. The processor is Intel's Core i3 2350M processor (2.3GHz) which when coupled with the 6GB of RAM, kept applications running fast with no noticeable delay during multi-tasking. In terms of storage on board the notebook, Samsung have fitted a huge 750GB hard drive, which should cater for the majority of users. This SATA II drive runs at 5400rpm, and offered speedy access during our test. The touchpad is located slightly to the left of centre, and as per most of Samsung's laptops offers a decent level of control over the notebook - it was both accurate and responsive to the touch. The 15.6" screen provides a decent window to the notebook, with graphics appearing clear and crisp. The colours stood out well, giving a visually rich browsing experience. The resolution was default at 1366 x 768 pixels, which felt about right for this screen size. In terms of connectivity, Samsung have provided you with the following input and output options: Ethernet, VGA, HDMI, Headphones, Microphones, 3 x USB ports, DVD as well as a built in card reader. The operating system ran well - this was Windows 7 Professional edition - whilst it would have been nice to see Windows 8 installed, 7 was more than adequate. Pros: Decent specification, ran well, nice overall design and construction. 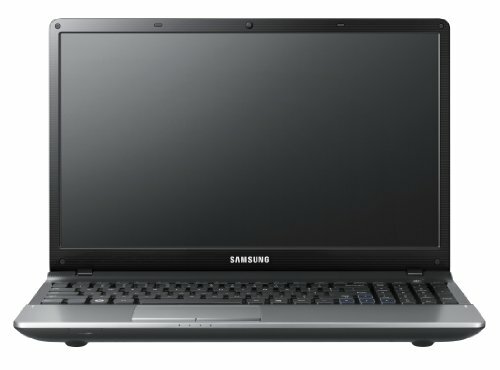 A good solid mid level laptop - if you're looking for good value for money, then the Samsung 300E5A is not a bad choice at all.